If you’ve been reading this blog for any length of time, you’re probably well aware of my historical tendency to begin a game and never finish it. 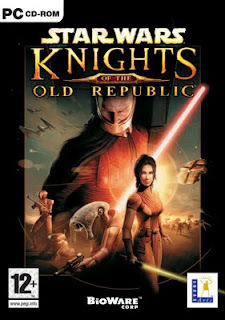 A few weeks ago, I decided to dust off my old copy of Star Wars: Knights of the Old Republic (for the sake of brevity, we will henceforth refer to it simply as KotOR). I have to say that it took me a fair bit of time to get this game to a working state on a Windows 7 computer. Eventually, I did get the game to work, and my relationship with the game began with a moment of triumph over the technology that was on hand. And this sense of power and achievement was consistently maintained during the entirety of my time with KotOR until the final credits finished crawling across my computer screen. The game centers on a group of plucky heroes led by a protagonist who begins to display sensitivity to the force. The group quickly becomes involved in the hunt for a Dark Jedi named Malak and a mysterious Sith object that can only be found by obtaining a number of star maps that have been hidden across the galaxy. Although the find-the-maguffin game structure is often tiring in video games, KotOR comes across as a very well-constructed Star Wars experience. Everything that a Star Wars fan would expect is present from recognizable settings and aliens to that familiar sense of humor that permeates the movies. At the same time, the game does a pretty good job of setting itself apart from the prequel movies—which were released around the same time—with a cast of characters that are memorable in their own right and a subtle indication that the story is taking place thousands of years before the events of the movies. It’s also worth emphasizing that KotOR is a BioWare RPG. The type of gameplay involved is a significant departure from the previous video games that were set in the Star Wars universe (including my beloved Dark Forces series). 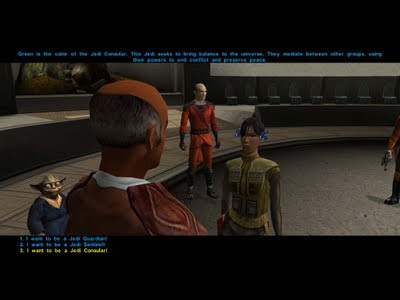 Instead of a focus on moment-to-moment player skill, the enjoyment in KotOR has much more to do with character building, tactics, and taking part in a grander narrative. It seems to me that this game offers a more holistic view of the life of a Jedi and their role in the universe. Think of it like this: in most Star Wars games, you take on the role of a powerful character: usually a Jedi, but sometimes a skilled pilot or rogue. 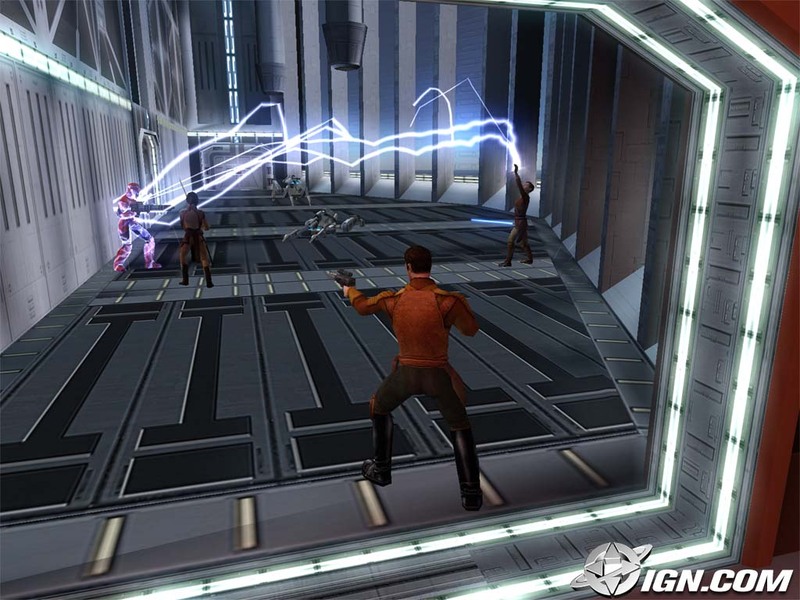 In these games, your main form of interaction with the world involves swinging your lightsaber or shooting your blaster so that you can kill stuff. KotOR offers more something more than that. Don’t get me wrong, I’ve always enjoyed playing as Kyle Katarn from Dark Forces, but Adim Mikdormin (that’s what I named my guy) turned out to be a more interesting character in this Star Wars saga. And in all honesty, this has more to do with the maturation of video games as an interactive storytelling medium than it does with BioWare's use of the license—though they did an spectacular job. While on the topic of plot, I would be remiss if I didn’t mention the big story moment in KotOR. It is such a great moment, and I could recommend the game just for that moment alone if the rest of the game weren’t equally enjoyable. It would have been one of the best plot twists in any game that I’ve played if I hadn’t accidentally spoiled it for myself while poking around in a FAQ. Stupid! 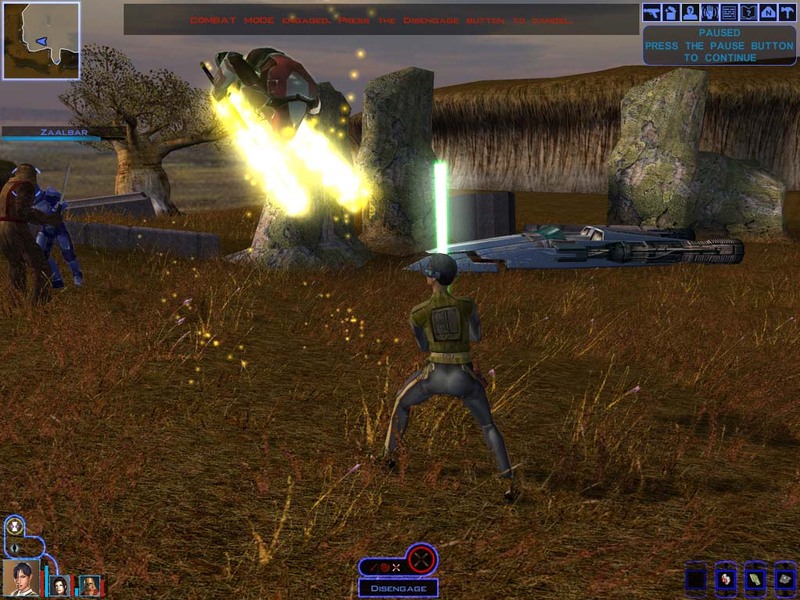 Being a long-time fan of both Star Wars and RPGs, it is no surprise that I enjoyed KotOR. BioWare did such a great job of capturing the charm of Star Wars, and they managed to marry that essence to a set of mechanics that forced me to step back from the moment-to-moment action that I was used to from previous Star Wars games in favor of the more directorial approach afforded by RPGs, allowing me to appreciate the cinematic and narrative quality of the game in a way that I hadn’t before.